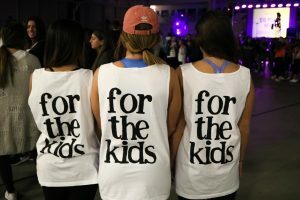 Students at the University of Rhode Island made national headlines over the weekend as they succeeded in raising $147,903.28 for the Children’s Miracle Network, exceeding the previous record for fundraising amongst first-year Miracle Network Dance Marathon events. 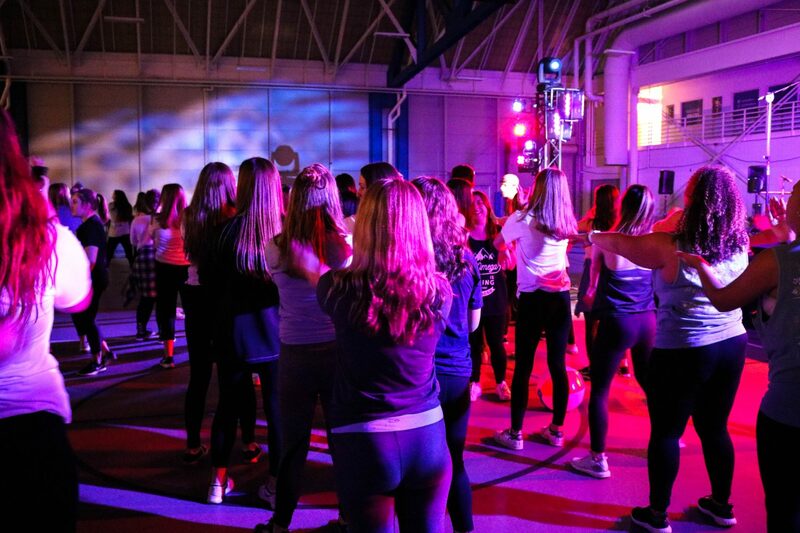 In its inaugural year, RhodyThon brought in over 1,000 students from different disciplines, organizations and affiliations to participate in the eight-hour event. 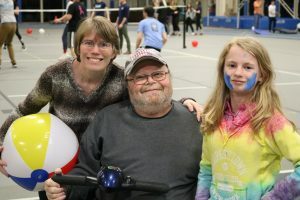 Able-bodied participants kept moving for the full eight hours, alternating between dancing, Zumba, volleyball games and basketball tournaments. raisers individually raising over $1,000 each. The amount raised shattered the previous record of $105,557.88, which was achieved by Louisiana State University in 2013 when they held their first Dance Marathon. 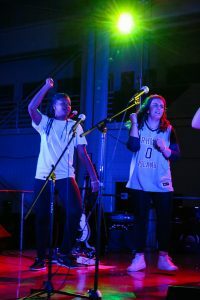 A DJ, live music and performances by Musically Inclined and the Ramettes kept the evening moving and people up on their feet. 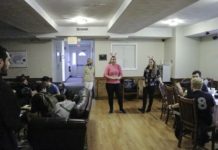 A “Power Hour” was held where participants could donate a certain amount to put their friend in “jail.” The challenge was for the person in “jail” to raise over the initial donation in order to be released. Participants were encouraged to donate directly to the website through their smartphones. Several stations were set up during the event so that participants could decorate cards for the children at Hasbro. Additionally, a “Why I Dance” wall was set up for people in attendance to say why they chose to participate. Many simply read, “For The Kids,” but other heartwarming sticky notes detailed personal connections to Hasbro or the Children’s Miracle Network. ut their relationship with the Children’s Miracle Network, and share their stories about Hasbro Children’s Hospital. For sophomore, Rob Gemma, Hasbro Children’s Hospital holds a special place in his heart. Born with Craniosynostosis, a rare birth defect that if left untreated could be fatal, Gemma would not be at URI without the organization. “I had an intense surgery on my skull at seven months old, so I literally owe my life to Hasbro,” explained Gemma. ond imagination. “Not only was it a great night spent with friends, but the money raised will save lives for years to come,” said Gemma. 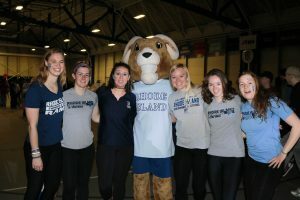 ore students thanks to the efforts of RhodyThon. 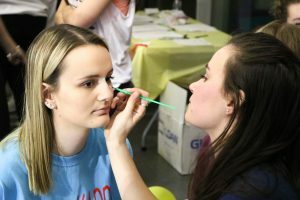 Hailey Flavin, president of the PanHellenic Council and executive director of student affairs for RhodyThon, said the night exceeded her expectations. “I am so incredibly blessed to have seen the success of RhodyThon first hand,” explains Flavin. Introducing the event and setting some ground rules for staying active and following safety procedures, Flavin found herself up on the stage several times throughout the night. She recounts looking out into the crowd and being moved by pride for the uniting of URI students. “Even by 2 a.m. there was energy from the audience and an eruption of happiness,” said Flavin. While the event lasted eight hours, no one was required to come for or stay through the whole time. However, excitement did ensue when the final amount raised was announced. “I regret leaving early so much, I wish I had stayed for the final reveal,” said sophomore Sydnee Reardon. Reardon’s sister is the Vice President of FTK at the University of Tennessee, Knoxville and hyped up how rewarding the experience is. Explaining how faculty and families on the campus benefit from Hasbro, Reardon believes the event is incredibly crucial. Seeing the success of the inaugural event sets a precedent. 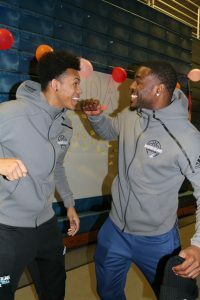 “I cannot wait to see what the program is morphed into as it continues for years to come,” said Flavin. All of the proceeds from RhodyThon were donated directly to the Hasbro Children’s Hospital in Providence.